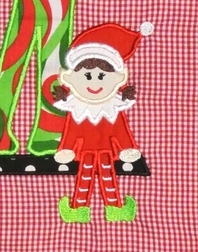 The Christmas Elf has arrived and has plopped up on the mantle. She is carefully watching all the little ones to see if they are nice or naughty! The outfit can be made as a dress or as a swing top and capris or pants in red gingham. 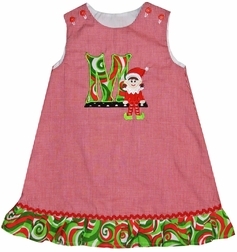 The hem of the dress/top and the trousers are embellished with a Christmas swirls fabric ruffle. The shoulders fasten with 2 red buttons. 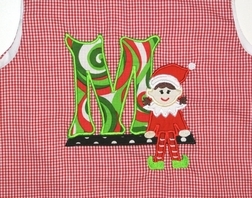 Your little one's first name initial is appliqued over the elf's right shoulder.